Balconies are often the ignored rectangular space home to a few neglected plants. But they have the possibility to create a true WOW experience for you! It can become a relaxation, creativity or entertainment corner or even an all-in-one. The good part is that home balcony decor doesn’t require a lot of time and can be done even within a tight budget. Even the smallest of balconies can go from drab to great if you put in a little thought on what you want to do with the space. A balcony is your home’s connection to the outside world. It is a little out-there and yet a space you’ve reclaimed from the city. There will be people passing by (or looking up) to your home, judging its interiors (and you) by what you put out there. That fact changes how much attention you should pay to your balcony design. 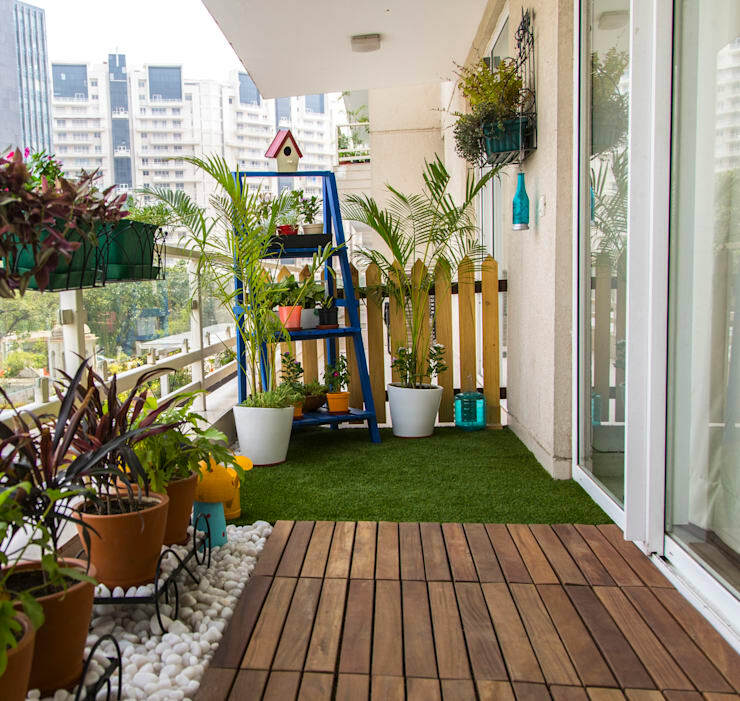 From classic Zen garden to colourful retreat, we're here to present you with creative balcony ideas that will make it your favourite place in the house! If you have a slightly larger balcony that can accommodate a seating arrangement, it is a great idea to have a bench or a couple of chairs put in. It will allow you to catch a relaxing moment in a day, sipping your favourite brew amidst the calm and greenery of your personal garden space. Wooden benches are generally preferred for a semi-outdoor space as it adds a natural feel among the plants. You can also go for an antique cast iron bench. Antique items give a feel of having been around for a while making the space more homely. Make sure you add a proper cushion to the benches so that your seating is comfortable. This space is generally devoid of extra cushions so make sure the one you add is comfortable to support long seating time when you want to curl up with your book. Flooring forms the base of the impression you want to create with the space. Because the balcony is semi-outdoors, it is more exposed to the elements than our interior space. This is why it needs extra treatment and proper upkeep. Start by choosing an interesting rug pattern that doubles up to look like a floor. 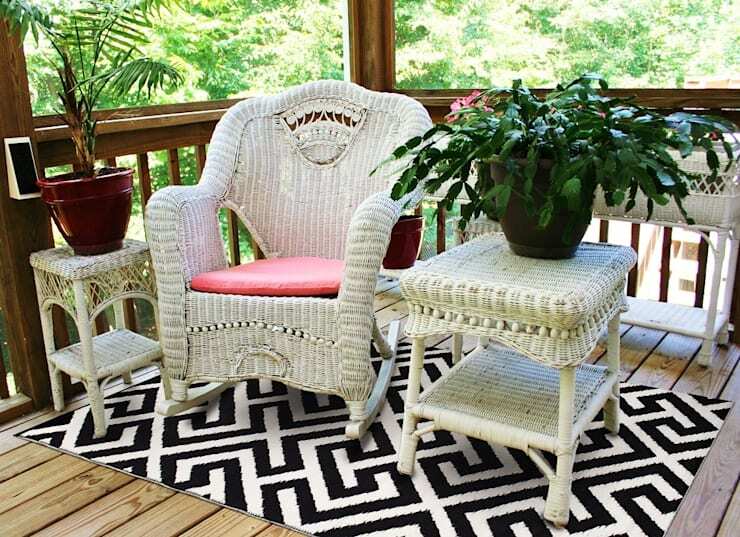 Adding a sturdy rug is one of the apartment balcony decorating ideas that not many easily explore, so this could be a great way for you to stand out. Protect the rug to be able to brace the elements and prevent staining. This is a perfect DIY balcony project. Apply multiple coats of water-based polyurethane. Cover the area with a drop cloth and place the rug over it and roll your first coat. The coat takes only about ten minutes to dry. Lift it up so that it doesn’t stick to the drop cloth. Repeat the process to apply at least three coats to make it fit for your balcony. You can also coat the back for extra protection. And the last step is to use a spray adhesive to stick it to a rug pad which can hold it firmly in place. A balcony cannot be complete without plants. They form your everyday connection with nature. To make the space hospitable for both you and them, you need to ensure that your planters don’t drain excess water into the floor. There are several DIY drip irrigation methods available which can solve this problem and also save you time every day from watering the plants. If your balcony tends to catch the wind, you can also add mulch to your plants to keep the soil from drying out. 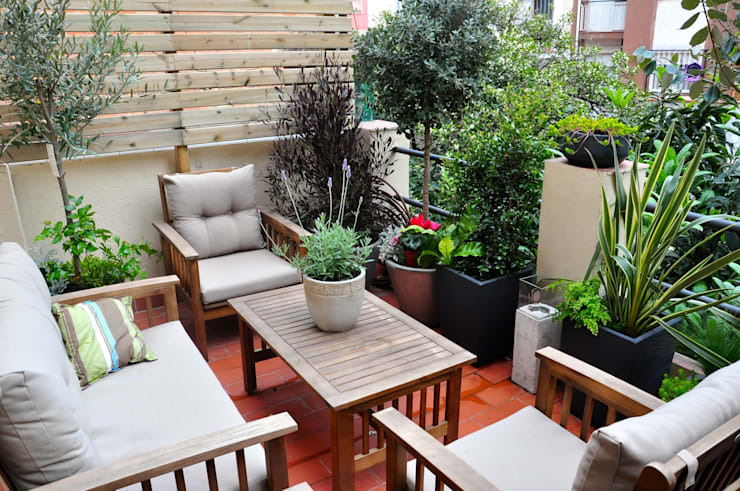 With tiny balconies and little floor space, you can hang the pots from the balcony walls, ceiling or sides. You can also create a vertical wall garden which comes with its own watering and drainage. This gorgeous arrangement by Indian company Studio Earthbox is the perfect example. While you enjoy the view of the outdoors from your balcony, you still want it to remain a private space. With careful coverings that blend into your balcony design, you can easily regain your privacy. Provide an overhead arch for quick creepers like climbing bauhinia, Cairo morning glory and Chinese feverine to cover the space. Not only will your balcony look amazing but the plants also shield neighbours from getting a look at what’s happening inside. Varieties of pothos (devil's ivy) are quick to take over the balcony and require very little maintenance. You can also use hedge plants that can be grown in pots to give your balcony privacy. The other option is to use a patterned or stenciled drop cloth hanging to cover the entire area. Start by getting the exact measurements of the wall and sew up the drop cloth accordingly, as once painted, this will be difficult to do. Start by sticking your drop cloth to a surface, measuring off the edges and using painters tape to mark your pattern. Once the paint is dry, use a grommet kit to hang the cloth up. Alternatively, you can use a curtain rod and rings to ease out the process. This one tops our creative balcony ideas list as it makes for a great no-fuss DIY project that can be varied in so many ways. The rope comes in fluorescent bright colours and costs little when bought from a local home improvement store. You can do it up in a simple moss stitch, ripple crochet or diagonals. The burst of colour brings the space to life and the material is long-lasting and rugged to support years of use. Not to mention the sense of happiness when you tell people you made it yourself! 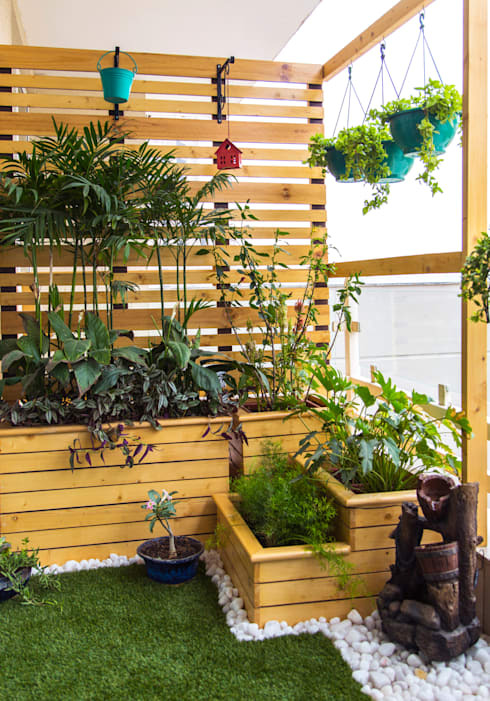 Wooden pallets work perfectly to accent home balcony décor. They can be used as side tables to hold your coffee cup. You can break them to use just one piece to hang from the balcony railing and free up your floor space. Reinforced, coloured pallets also make for a great seating option which can be hung on the wall when not in use. You can use it to create a step case to hold your plants. Better yet, you can add a lining to them to create planters. Pallets can be used creatively almost in every corner, making it a great addition to your balcony. Once you get started, you’ll notice so many apartment balcony decorating ideas that can be achieved easily with things already available at home. Hang an existing artwork and paint the walls. Use an artificial grass rug to add to the outdoor mood. Add a hobby corner for your painting desires or room for your shell collection. Most importantly, have a balcony that will make people take a second look! Collect more unique ideas from our ideabook The homify guide to porch lighting. Which is your favourite idea here? Let us know in the comments!